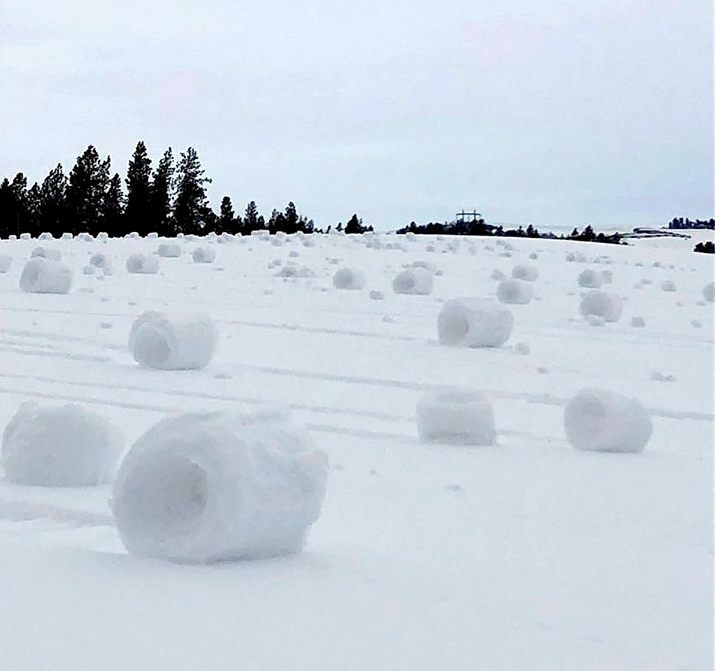 "For more than half a century snow rollers were used in Vermont to pack down snow on country roads rather than plowing it off." Six rare "snow rollers" were spotted by Brian Bayliss in Wiltshire. 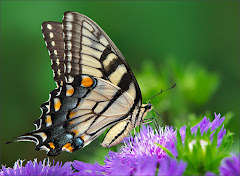 He said he spotted them in a field he owns and at first thought they had been manmade but there were no footprints. This is not a new phenomenon, but the photos at the BBC are some of the best I've ever seen. "large bundle or package of merchandise prepared for transportation," early 14c., from Old French bale "rolled-up bundle" (13c., Modern French balle), from Frankish or some other Germanic source (such as Old High German balla "ball"), from Proto-Germanic *ball-, from PIE root *bhel- (2) "to blow, swell." The English word perhaps is via Flemish or Dutch, which got it from French. I've often thought that would be a good way to handle secondary roads here in NH. Plowing and salting to get back to bare pavement seems to be very wasteful. With snow tires there is an amazing amount of traction on packed snow. We have plenty of dirt roads around and they don't usually get plowed back to dirt, and they are fine to drive on. I imagine we could extend that to other roads as well. I asked my mom about this, and she remembers in the early 30s taking a sleigh to church on Sundays (memorable because the children were allowed to ride the back runners on the way home). 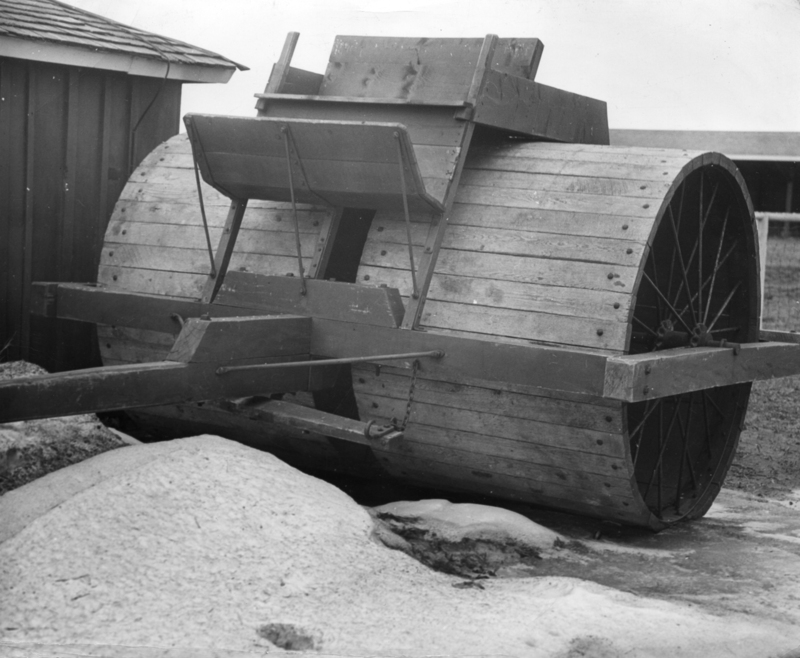 She says she never saw a "snow roller" (this was Minnesota) but that it would have made sense in the era of sleigh traffic, when you wanted snow on the roads in winter, not gravel. Snow pack is the safest stuff to drive on in winter. Salting and plowing to bare roads only works when it works... but usually it doesn't. Even if the weather cooperates you get snow drifts that cross the roads sometimes. And when the snow keeps coming, you just get a mess of changing road conditions, snowy wet slick icy dry, and everything in between. Much better to have a consistent surface. Then your stopping distance and traction don't keep changing constantly. 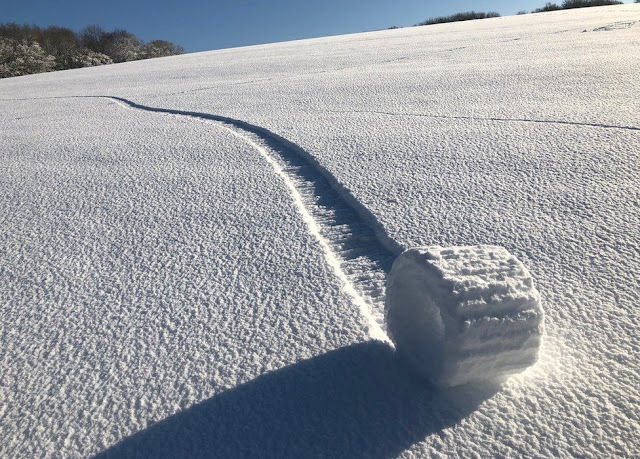 Eric Sloane illustrated a snow roller in one of his books. He mentioned that winter was the time to move heavy loads, using ox-drawn sleds on compacted snow -- it was much easier than driving wheeled carts in the ruts. Snow was actually shoveled onto covered bridges so that sleds and sleighs could cross. The compacted snow made travel and hauling so much easier! Interesting. It certainly makes sense. i just a couple of days ago read about both types of rollers in a book on north american weather. I love love love driving on snowpack! Wish more municipalities would do that instead of half failing to get back to pavement.